“Buy?” I ask my daughter, hopefully. It’s her standard response when offered a toy, food, a bath. At fifteen months, books are her best friends, and have been for as back as she can remember. What’s the right age for a child to start reading? The answer, as far as I’m concerned, is it’s never too early nor too late. I had an enviable collection of books as a baby, and I love a snapshot of me at ten months old, lying in bed reading! We first started reading to eM when I was six months pregnant. Her dad would read her The Very Hungry Caterpillar, and I’d read her Guess How Much I Love You. When she was born, we shifted to easy board books with black and white illustrations. As she grew, so did her interaction with the books. Her eyes would flicker as I showed her trees, a dog, a bird. She was able to turn the pages on board books before she was able to turn her own body around! At their most basic, books help babies develop hand-eye coordination, and refine their pincer grip. Books with flaps, pull-out tabs, and touch & feel panels encourage motor skills development too. Many people ask, “Why start so soon?” – they associate children’s books with learning, rather than fun. But just as adults pick up a book for pleasure, so too can children. I agree it takes a bit of digging to find a children’s book without a purpose (learning shapes, identifying numbers, discovering morals). DK has a fantastic, affordable collection on themes like Playtime, Bedtime etc, which are easily available on Amazon and Flipkart. Most of the other books you’ll find on these sites are imported, and can get expensive. If you’re a book lover who wants to find a broad range of children’s books, your best bet is a Facebook community. Several of these communities import children’s books, some preloved, and sell them at very pocket-friendly rates. My personal favourites are Eat Play Read, and Wee Bookworms; the latter of which sells books by weight (Julia Donaldsons at Rs.40! It doesn’t get better than that). I think there’s also value in introducing children to books by Indian authors. The only challenge is that most of these are paperbacks, so you’ll have to wait until your baby is old enough to treat them well. 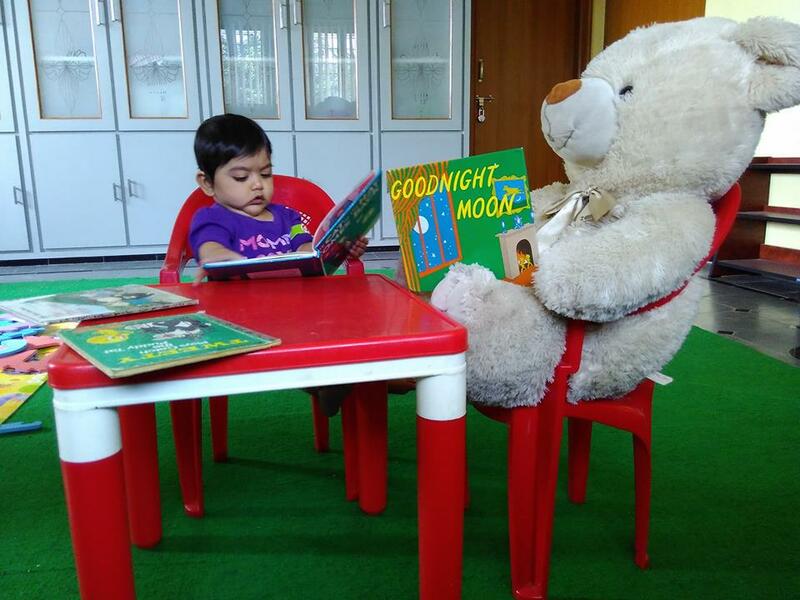 At the one year mark, we got eM a few books from Pratham and Tulika. She loves looking at the babies featured in these books, who look just like her, and use the same words she knows (‘Amma’ for instance). Somewhere along the way, I stopped to count, and realized she owns over 70 books! There are some which she didn’t take to at first, but which she now comes back to. There are some which she should be too young for, but which she enjoys anyway. There are others she insists on being read daily. When she’s sleepy or cranky, I can narrate the lines from one of these old dependables and she calms right down. Many a flight take-off has been to the accompaniment of ‘Peekaboo Baby’! If I happen to be busy, she can entertain herself flipping pages and saying the words that she knows. Personally, I think increased vocabulary is the least of the benefits from reading books. Reading together is a bonding experience, just as much as bathing or massaging a baby is. And as I said before, it’s never too early or late to start!